In this type of tibial hemimelia, there is a knee joint present. The degree of deficiency of the proximal tibia varies, but the knee is present and functional. To re-establish the integrity of the tibia, the fibula is transferred to the tibia at the level of agenesis of the tibia. The foot is in very severe equino-varus. The lack of a distal tibia precludes a successful functional ankle joint. Previous attempts to perform a biologic arthroplasty by various means, including by transferring the proximal fibula on its vascular pedicle, distally to the level of the ankle joint so as to create a tibial plafond, has met with recurrent deformity and failure. Fusion of the talus to the distal fibular epiphysis remains the best option. The proximal tibial epiphysis, physis and metaphysis are well formed in Paley type 4A tibial hemimelia. A patella is present, and active and passive knee motion is present through a normal range. The fibula is overgrown and proximally migrated, and the foot is in extreme equino-varus. The cruciate knee ligaments may be absent, and some knee instability may be present. Treatment is carried out in two stages. In the first stage the Achilles tendon is tenotomized. 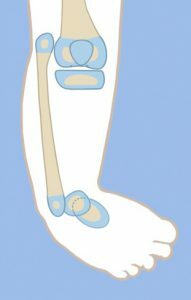 Two wires are inserted into the fibula and hooked around both ends of the fibula to prevent physiolysis during distraction. These are called temporary epiphysiodesis wires. At the distal end of the fibula one of these wires is bent at 90° to be fixed to the distal tibial ring for distal transport of the fibula. A computer-dependent circular external fixator with one ring on the femur and one ring on the tibia is applied. The knee is locked in extension by inserting one retrograde axial wire through the distal tip of the tibia up to the level of the knee joint. This tibial wire is then bent at 90° to connect to the femoral ring and hold the tibia in full extension at the knee joint. The femoral fixation includes two half-pins and one olive wire or a third half pin. The distal ring is fixed to three calcaneal wires and one talar wire. Six struts are connected between the rings and computer planning is carried out. After surgery gradual distraction is done in two steps. In the first step the proximal fibula is realigned to correct varus-fiexion deformity at the knee and transported distally to bring the fibular head down to station next to the tibia. The temporary epiphysiodesis wires inside the fibula that are hooked around the head of the fibula prevent physiolysis during this distraction. It can take 6–12 weeks to complete this first step. The second step is to gradually correct the foot equino-varus. This is done by redoing the computer planning and not by surgery. Prior to starting this second correction schedule, the fibular wire is disconnected from the distal ring and connected via a long threaded rod to the proximal ring. This holds the fibula at station, while the foot is corrected out of its deformed position and then distracted to bring the talus below the distal fibular epiphysis. The foot correction usually takes another 6–12 weeks, depending on the degree of equino-varus deformity and the amount of lengthening required to transport the talus beneath the fibular epiphysis. 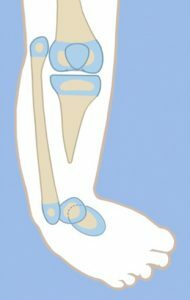 Once the foot is plantigrade and the talus is under the fibula, a second surgery to fuse the ankle and transfer the fibula to the tibia is performed. A few days before this surgery, only the tibial wire is removed to allow its pin site to heal prior to surgery. The foot ring and wires are removed. The pin sites are covered with an occlusive dressing to minimize contamination during surgery. After the leg is prepped and draped free, a transverse lateral incision is made over the distal tip of the fibula. The distal epiphysis of the fibula and the dome of the talus are exposed. The capsular connections between them are cut to mobilize both bones relative to each other. A small incision is made proximally over the fibular wire. The fibular epiphysiodesis wires are cut proximally and pulled out distally. Two new wires are immediately inserted in the same track to protect the fibula from fracture. The fibula is osteoporotic at this stage, and without an intramedullary wire it could easily fracture due to manipulation that can occur during surgery. These two wires are brought out proximally through the small incision made over the head of the fibula. The distal fibular epiphysis is cut across its ossific nucleus. The talar ossific nucleus is exposed by cutting across the dome of the talus parallel to the sole of the foot. The two ossific nuclei are then aligned, and the proximal wires are advanced through the talus and out the sole of the foot to hold the foot plantigrade to the fibula. A Z-shaped incision is made around accessory skin pouch at the end of the tibia. The proximal longitudinal limb of the Z is medial to the tip of the tibia, the transverse part is in the crease below the tip and the longitudinal distal limb is lateral to the tibia. Fasciotomy of the anterior compartment is carried out. The tip of the tibial bone is uncovered. The anterior compartment muscles are elevated off of the lateral aspect of the tibia, and an extra-periosteal path is dissected to the fibula along the interosseous membrane. The fibula is exposed subperiosteally. The tibia is osteotomized near its tip to create a fresh surface for union to the transferred fibula. The wires in the fibula are pulled back to the level of the planned osteotomy. The fibula osteotomy is made at the level of the tibial cut. The fibula is then shifted over to the tibia under the muscles. The fibula is fixed to the tibia by first advancing the intramedullary wires. The fibula is then plated to the tibia using a mini locking plate and screws. All of the incisions are now closed in layers. External fixation wires are reinserted in the foot. These wires are fixed and tensioned to a ring. Six struts are connected between the femoral ring to the foot ring. The external fixator maintains the alignment of the foot and knee to achieve fusion of the tibia and fibula proximally and of the fibula and talus distally. A transverse fibular wire is added to compress the ankle fusion site. Ankle fusion takes approximately 3 months. After that, the external fixator is removed, leaving one wire buried in the foot and fibula to protect the fibula from fracture. The knee motion is restored with physical therapy. In the future, lengthening of the one bone leg can be carried out without crossing the knee joint. If symptomatic instability of the knee joint arises from the congenital absence of cruciate ligaments, the knee joint ligaments can be reconstructed. In this type of tibial hemimelia, there is only a proximal tibial epiphysis present and no proximal tibial physis. The proximal tibial epiphysis is often unossified at an early age. The foot is in severe equinovarus, and the fibula is relatively overgrown and proximally migrated at the knee. The treatment preferred is also a two-stage surgery similar to that described for Paley type 4A tibial hemimelia above. Since the tibial epiphysis is so small it needs to be fixed to the proximal femoral ring with an axial wire and/or a transverse tibial epiphysis wire to prevent the tibial epiphysis from being transported distally during the distal transport of the proximal fibula. There are two options for the fibular transport. The first option is to bring it down to station and then osteotomize as described for type 4A. The second option is to distract the fibular head below the level of the proximal tibial epiphysis. In this case the proximal tibial epiphysis is fused to the proximal fibular epiphysis. This has the advantage of preserving and transferring the proximal fibular physis to become the proximal tibial physis, thus reducing leg length discrepancy from the absence of a proximal tibial physis. Since the proximal tibial epiphysis is too small for plating, intramedullary hooked wires as shown for Paley type 5A tibial hemimelia can be used instead. If the proximal tibial epiphysis is unossified, then BMP2 is inserted into drill holes in the epiphyseal cartilage. The fixator remains in place for approximately 3–4 months until the proximal fibula fuses to the tibial epiphysis proximally and the distal fibular epiphysis fuses to the talus distally. After fixator removal, a cast is used for 1 month, followed by a knee–ankle–foot orthotic (KAFO). Knee range of motion is restored with physical therapy, including active and passive range-of-motion exercises.